Red 5 Studios says it needs to "rethink" Firefall PvP modes because its pursuit of the e-sports space just isn't working out. It's not often that you hear a game studio admit that one of its products just isn't working out, but that's exactly what's happening over at Red 5, the studio behind the free-to-play MMO shooter Firefall. Red 5 CEO Mark Kern said the studio has "pursued the controversial e-Sports route" with the game but acknowledged that "it's not working very well," noting that JetBall, its "last big attempt" to establish a PvP e-sports mode, attracts less than three percent of PvP players. "Also, PvP has suffered as our focus has had to focus on the popular PvE part of our game. 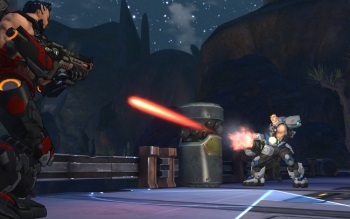 People want more content, fewer bugs, and more polish on these world systems," he wrote on the Firefall website. "For these reasons, we have made the tough decision to suspend PvP and take the system offline so that we can rethink it and relaunch it. PvP is an important part of our game, and we want to get it right." "So we're going to regroup, rethink, and deliver the best PvP system we can that can be enjoyed by everyone," he continued. "We don't have a timetable for this, but at some near future point we will shut off the PvP aspect of the game, which we feel does not represent Firefall at its best, and relaunch that part of the game when its ready."